CCD inspector run on 10 minute sub. Recently I changed up my imaging rig and replaced my Optec 5 position filter wheel with a new sBig 8 position wheel. I also removed the reducer from my Takahashi FSQ 106ED and now I'm running at prime focus or the scopes native f/5 configuration. After a couple nights of testing and some much needed cable management, over the last 2 nights I've been able to squeeze 4+ hours of sky and try a true image run. The results have me encouraged. My new set-up is producing the flattest fields I've had with this scope. 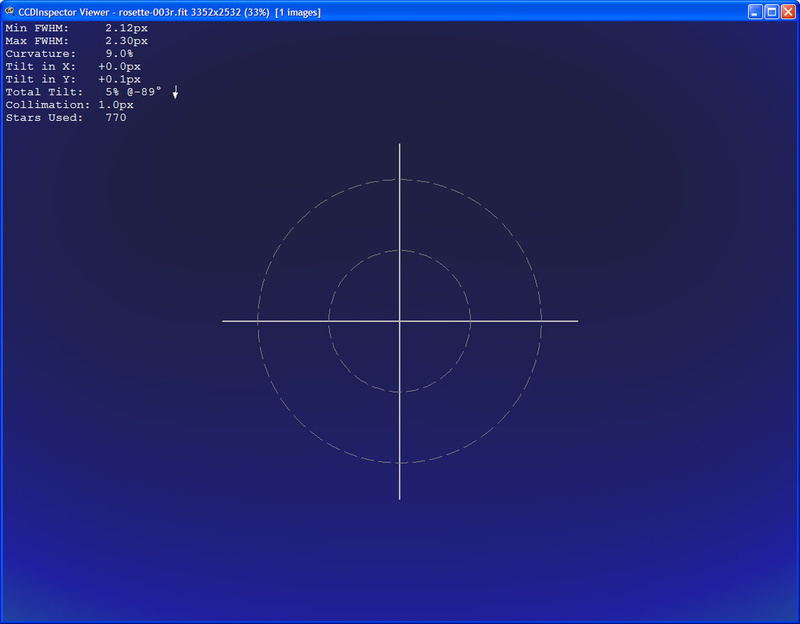 The image to the right is the CCD inspector curvature map showing the scope field flatness, the darker the blue the better and if you click to enlarge you can see the tilt in X is 0.0 and in Y it's 0.1., nearly perfect in both axis. Below is a quick stack of my 28x10 minutes subs of Ha. I hope this trend continues! Looking forward to getting some RGB data later this week at SeaGrape Dr.